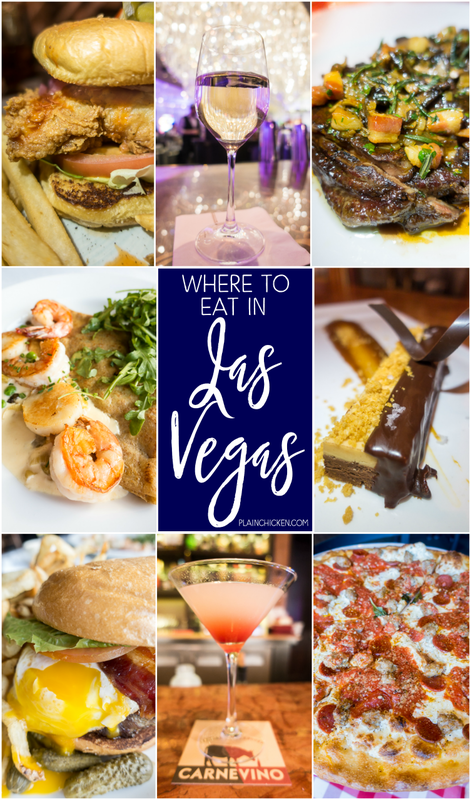 Where to eat in Las Vegas - some of the best food in the world is in Las Vegas! 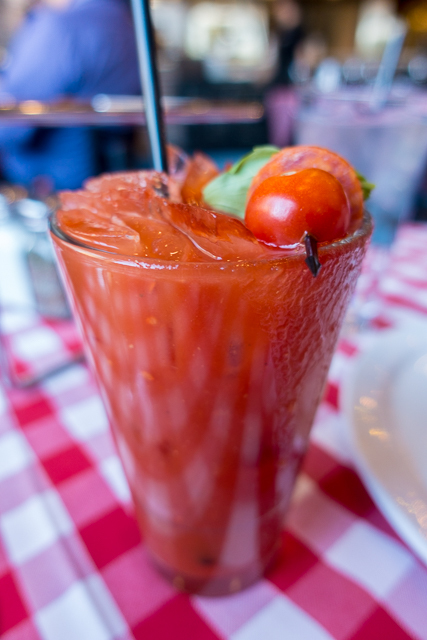 Great list of places to eat on and off The Strip! 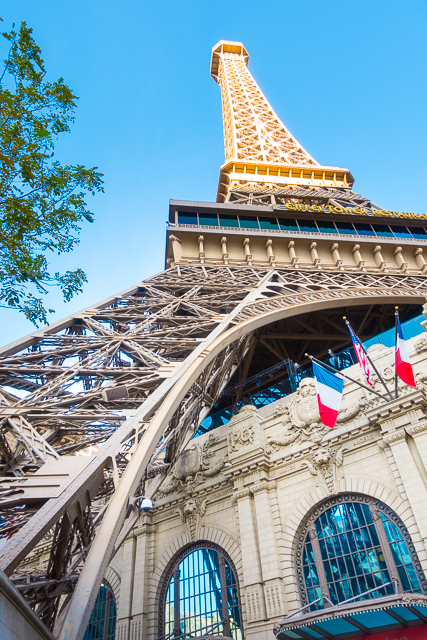 Las Vegas is one of our favorite travel destinations. 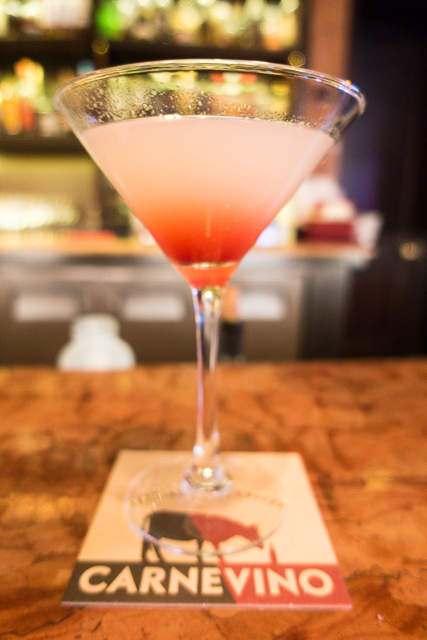 We love eating, drinking, shopping and doing a little gambling. 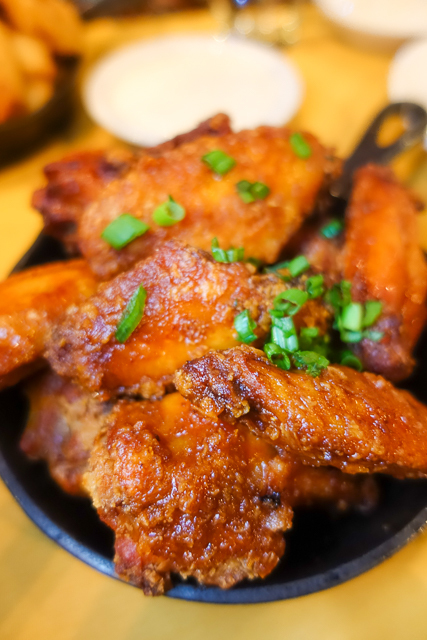 Today I'm sharing some of our favorite places to eat in Las Vegas. There are several favorites and a few new places on the list. We even ventured off the strip for the first time! Keep reading to see all the delicious food!!! On our last trip to Las Vegas, we stayed at The Palazzo. We got into town around lunch and headed straight to Table 10. I got an order of the Sriracha & Sweet Chili Wings. It came with a Buttermilk BACON Ranch! 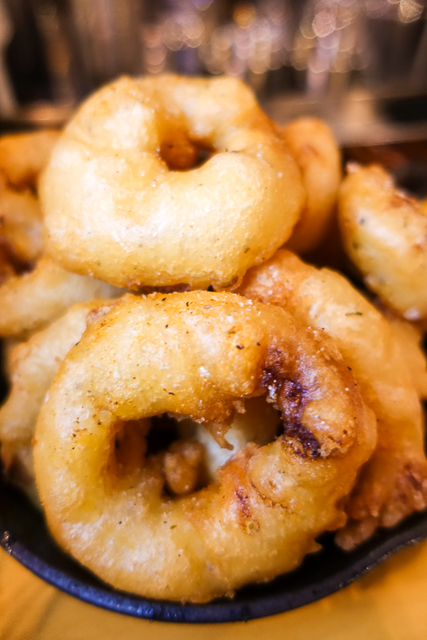 I also got an order of onion rings - fantastic!!! Lavo is a MUST on our Vegas trips. 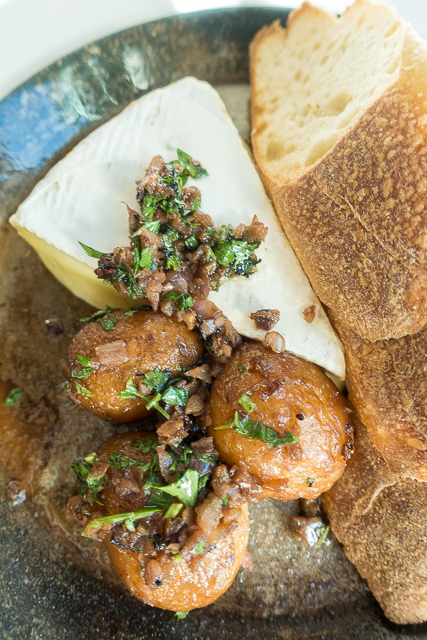 We usually just snag a seat at the bar and have some appetizers. 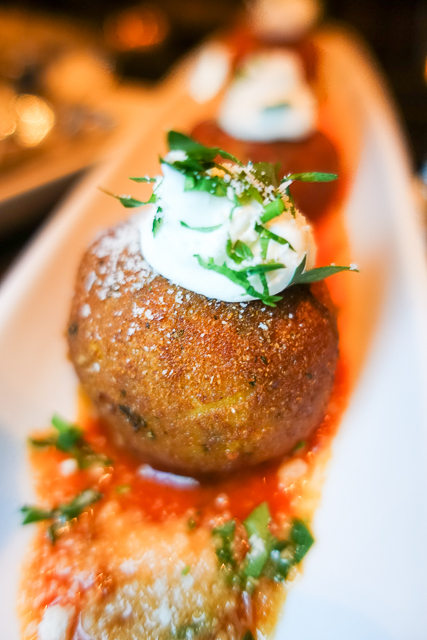 We always get an order of the Arancini. I LOVE the arancini. Fried risotto balls stuffed with Kobe beef. 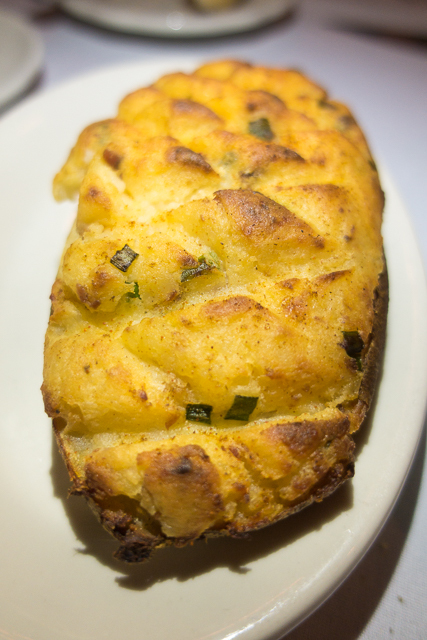 Their garlic bread is second to none! Ridiculous! I could eat a whole loaf by myself. 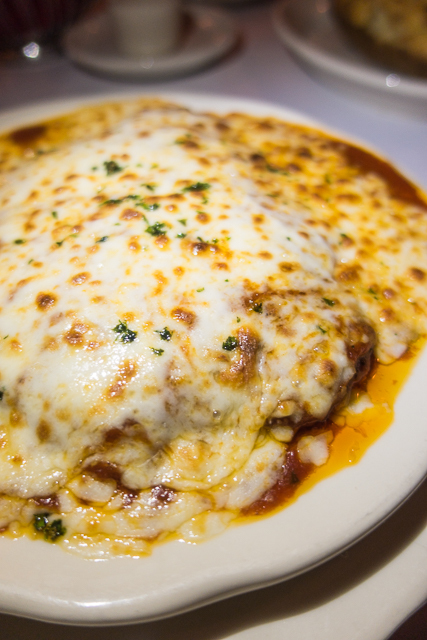 If you go to Lavo for dinner, get the Meatball with whipped Ricotta. It is HUGE! Split it with someone. It is to-die-for! Buddy V's has become a favorite for us in Vegas. They have CRAZY good desserts. There is a restaurant (Buddy V's) and a bake shop directly across from the restaurant. 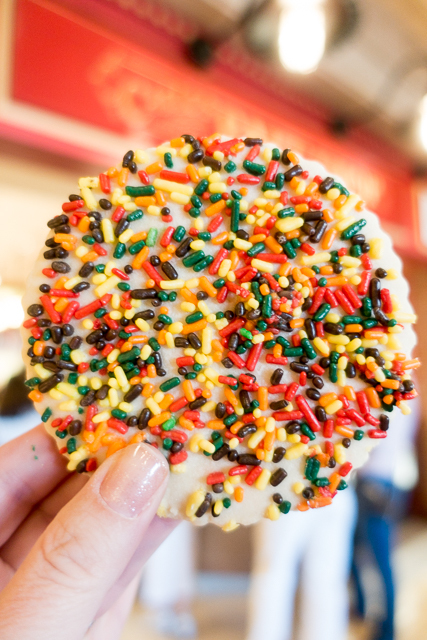 Carlo's Bake Shop is full of amazing treats. The lines are LONG! GO EARLY! 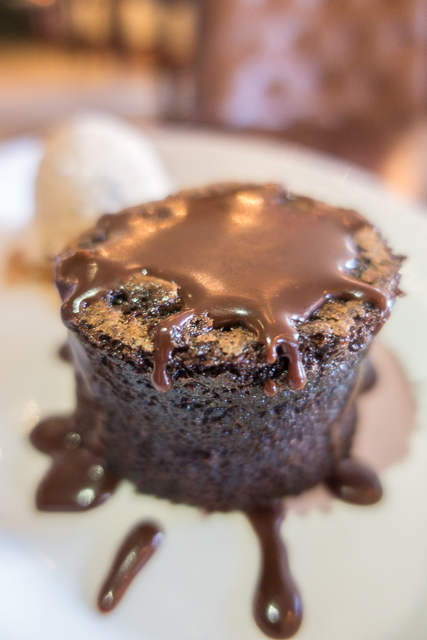 The Warm Nutella Cake in the restaurant is TO-DIE-FOR!!! 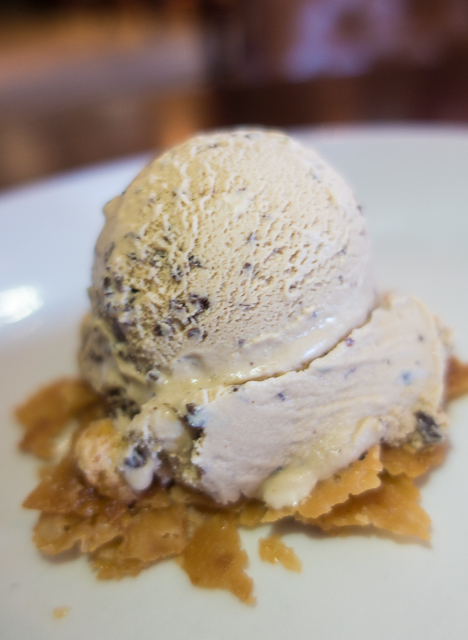 It comes with Salted Caramel ice cream on top of a Hazelnut Brittle. 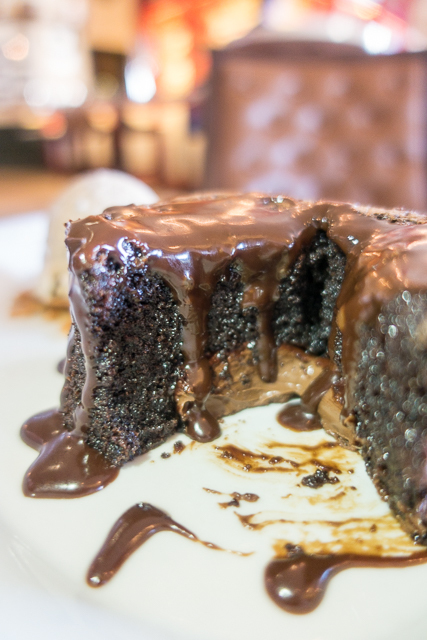 It might be the best dessert in the world! We love to shop at The Forum Shops in Caesar's. 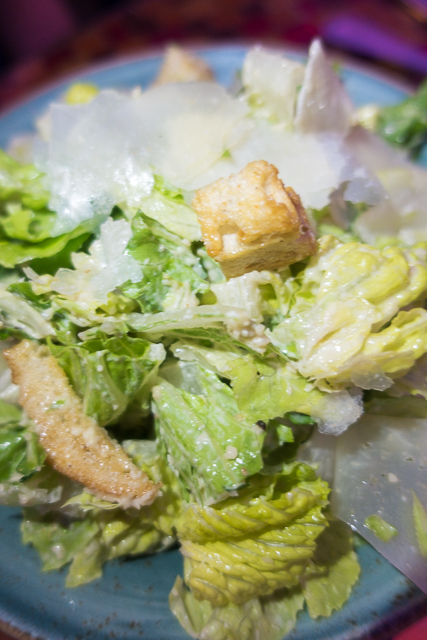 We took a break from shopping and had a delicious lunch at Trevi. Trevi is located in the middle of all the shopping and has great people watching!! 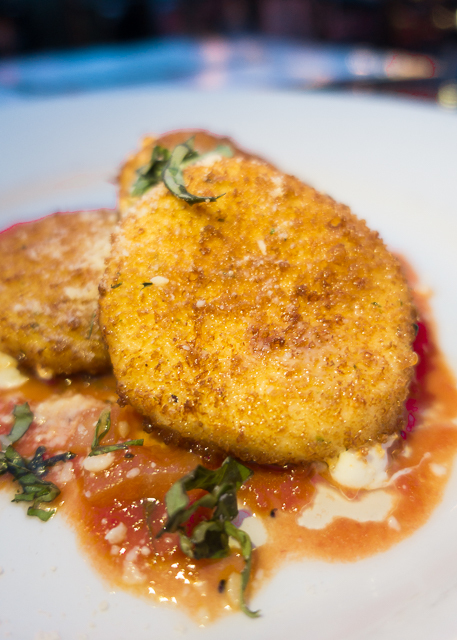 We started with the Fried Mozzarella - SO good! The complementary bread and oil was really good. We especially loved all the fresh garlic in the oil. 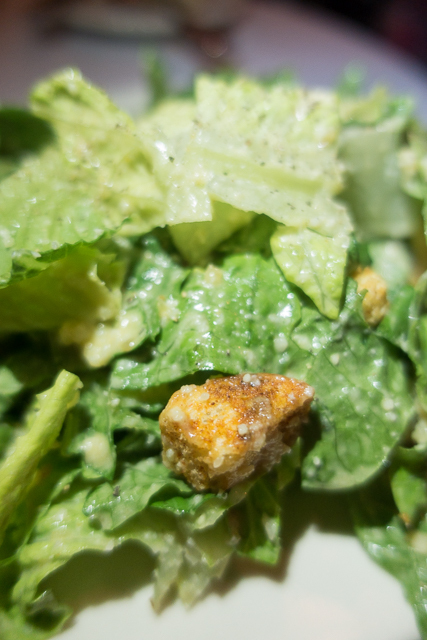 Chicken Legs got a Caesar Salad. It was big and very good. We split a pizza and couldn't finish it. Trevi takes reservations, but we didn't need one for lunch. We walked up and got seated right away. 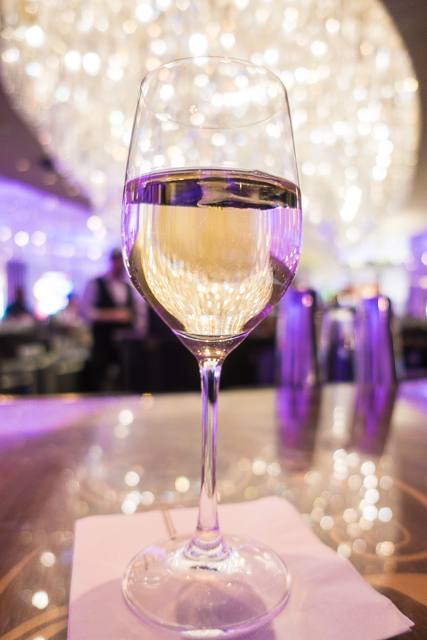 We love to stop in for a drink after shopping at The Chandelier in The Cosmopolitan. The bar is enclosed with thousands and thousands of crystals. The bartender will try and sell you a secret drink that isn't on the menu. It is called a Verbana. It comes with an edible flower that makes your mouth numb and supposedly makes the drink taste differently. The prices are a bit higher than some of the other bars on the strip. 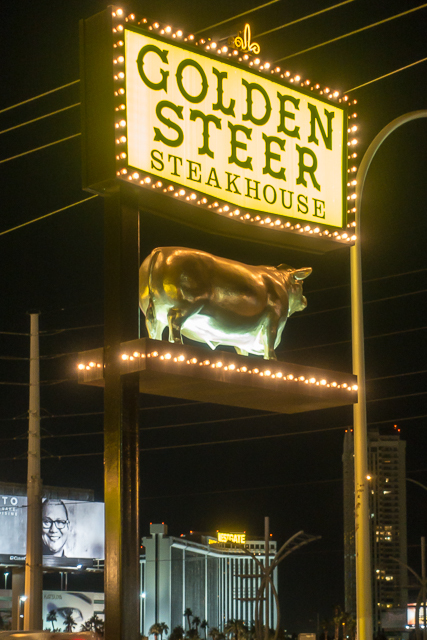 On a previous trip to Las Vegas, a few of our Uber drivers told us to check out Golden Steer. It was The Rat Pack's favorite place in Vegas. We LOVE The Rat Pack, so decided to give it a try. 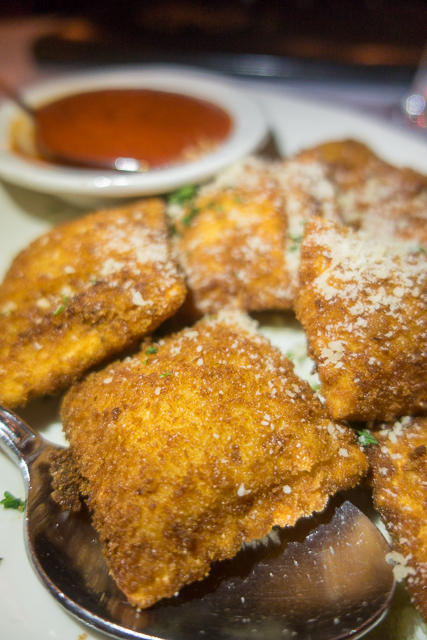 We started with the Fried Ravioli. Chicken Legs got his standard Caesar Salad. For the main dish, Chicken Legs got the filet. It was delicious. Cooked to perfection. For his side, he got the twice baked potato. I decided to get the Chicken Parmesan for my entree. 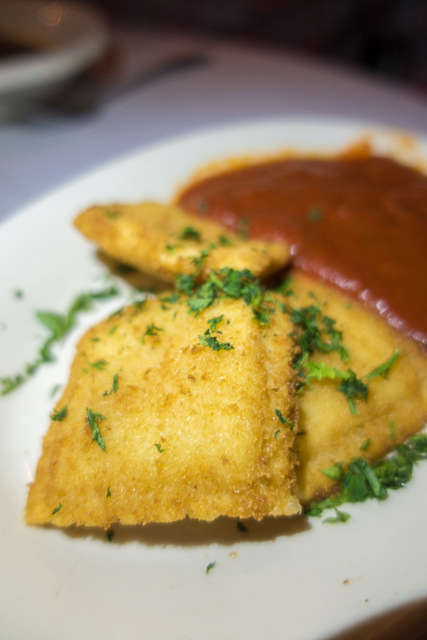 It came with a side of ravioli. Look at that! OMG! Ridiculously good!!! The Golden Steer is a Vegas institution. You can sit in The Rat Pack's booths. 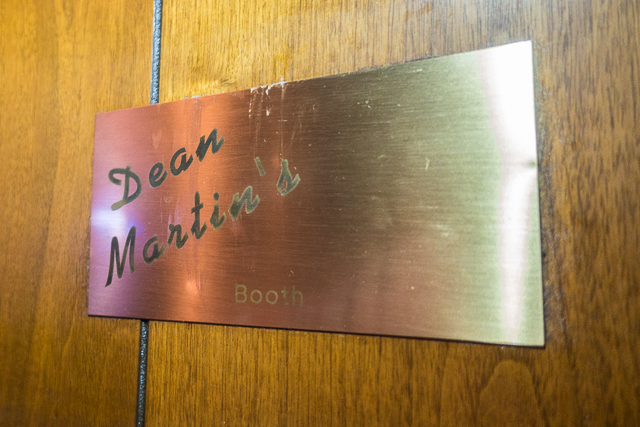 We sat in Dean Martin's booth. Frank Sinatra's and Sammy Davis Jr's booths were right next to us. 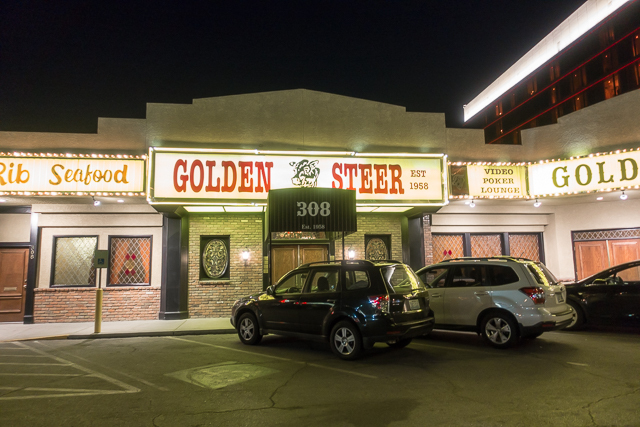 The Golden Steer is located off The Strip on Sahara. They take reservations. We took an Uber from the hotel and it was a breeze to get there and back. We are 100% going back on our next trip. 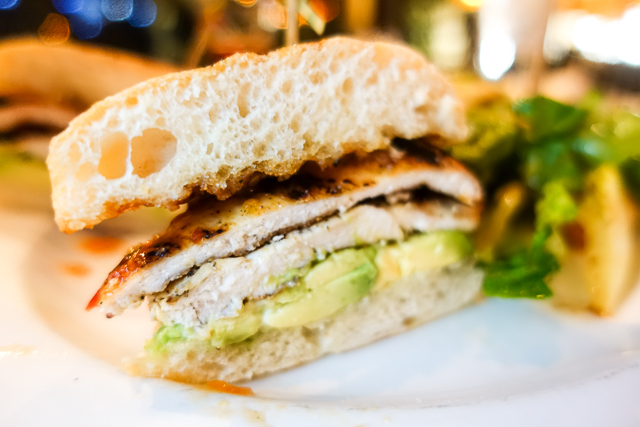 We love Mon Ami Gabi for lunch. This time we started with the Brie. 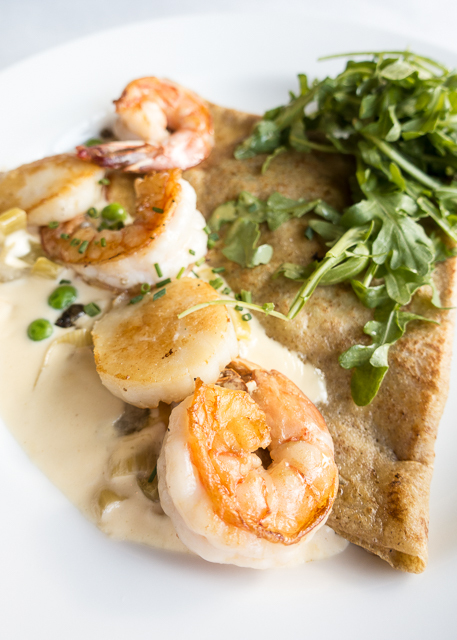 Chicken Legs got the Shrimp Crepes for his entree. I decided to try the Burger. I've never eaten it at Mon Ami Gabi, and it did not disappoint!!! 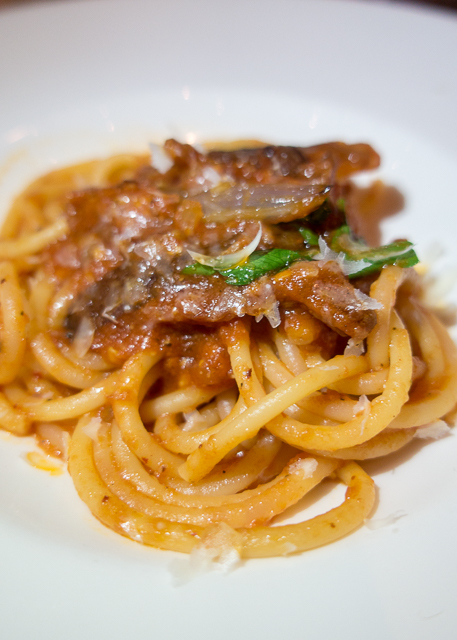 Carbone is one of our all-time favorite places to eat. It is a MUST every time we go to Las Vegas. We ate the exact same thing on this trip as we did the last time we ate here. We started with the Proscuitto and Fresh Mozzarella. 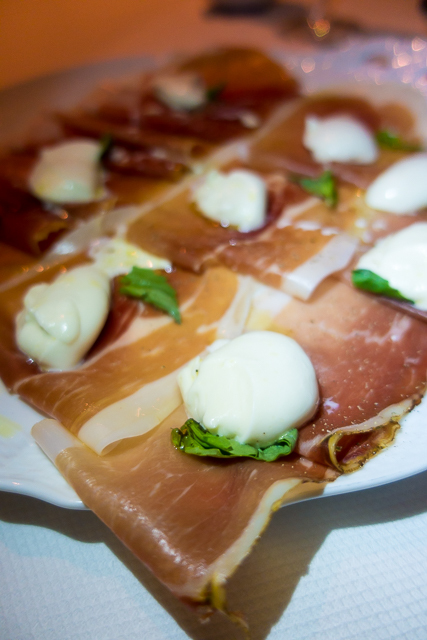 There are three types of prosciutto and they are topped with house made mozzarella that they cut table side. 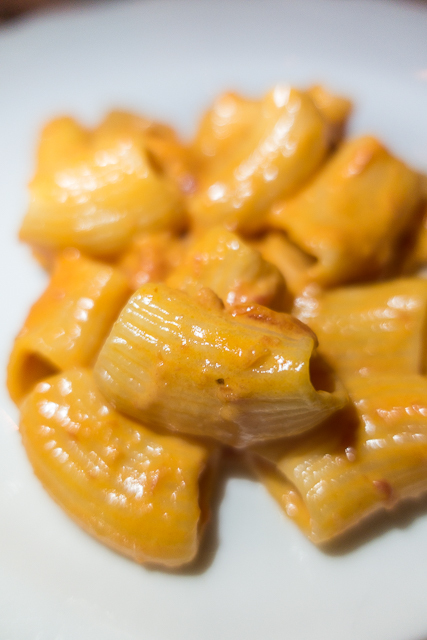 The Spicy Rigatoni Vodka Pasta is my FAVORITE pasta EVER. 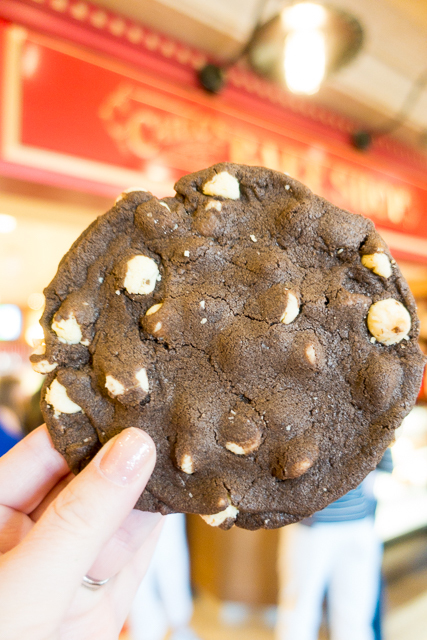 We always split it, and I always regret sharing. 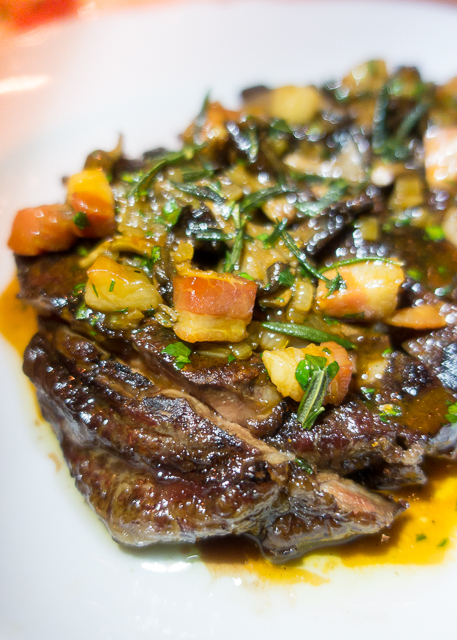 The Ribeye Diana is one of the best steaks we've ever eaten. Topped with herbs and pancetta. SO good! Even though we were incredibly stuffed, we tried dessert. 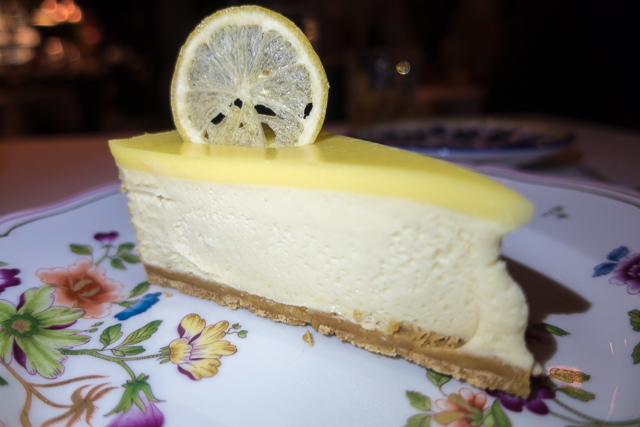 Lemon Cheesecake. It was absolutely AMAZING!! I wish I had a slice right now!!! 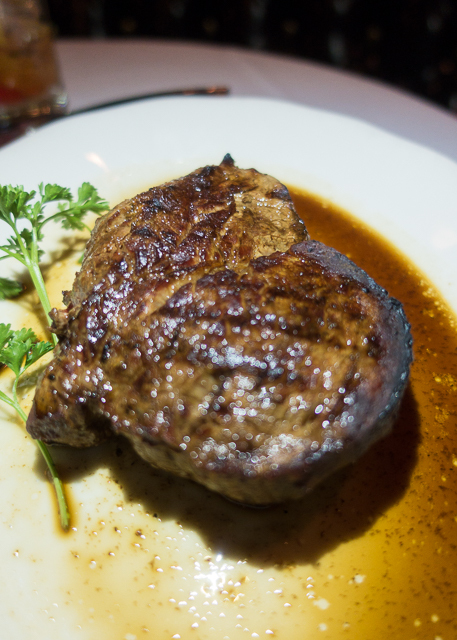 Make a reservation for dinner at Carbone - you won't regret it! 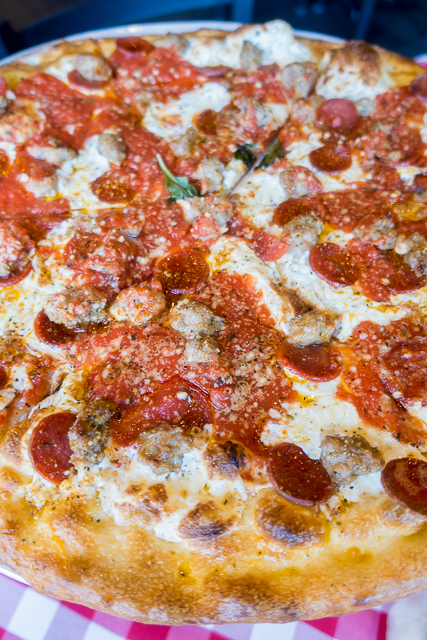 Grimaldi's is one of our usual lunch spots. We love it! 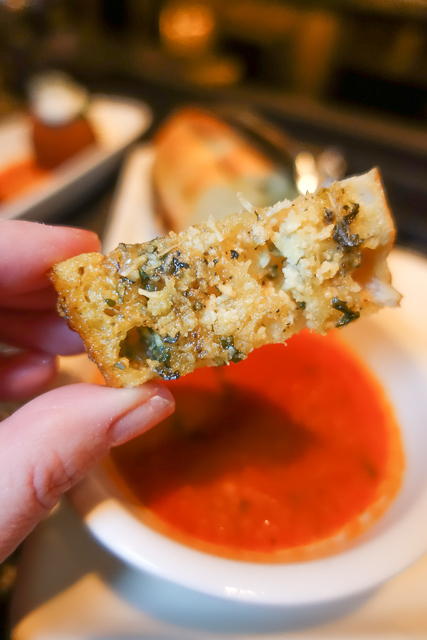 The sauce is so good and we LOVE all the fresh mozzarella cheese. 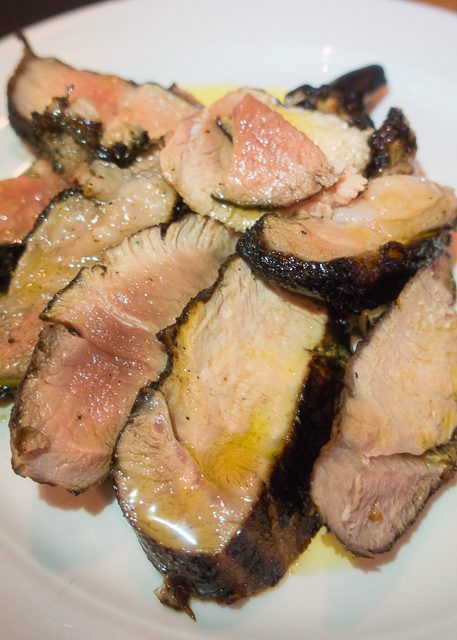 Carnevino is another one of our Las Vegas favorites. We always come in for cocktails and at least an appetizer. On this trip we ate dinner in the bar. We started with the Tagliatelle Bolognese - it was so good that I wanted to lick the plate. 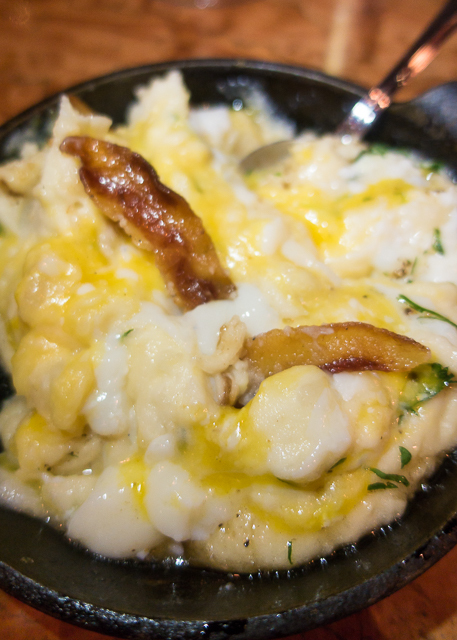 We got a side of Mascarpone & Guanciale Mashed Potatoes. 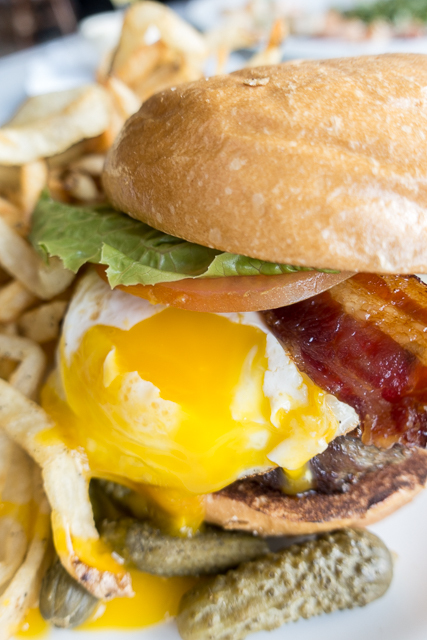 It comes topped with an egg. The cut and chop up the egg table-side for you. Hold me. These potatoes were SO good. 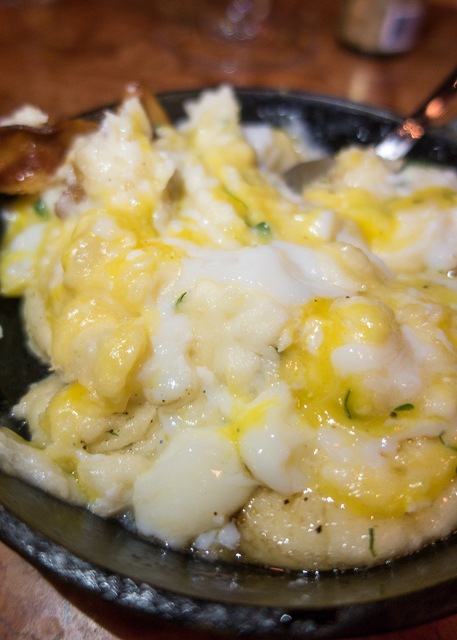 I'm not really an egg in my potatoes person, but these were THE BEST! For our entree we split the pork chop. Seriously the best pork chop I've ever eaten. I loved it more than any steak. I am dying to get this again. 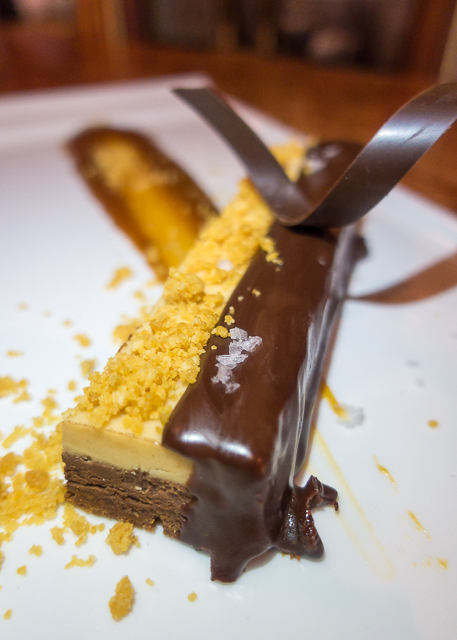 It come with crumbled peanut brittle and salted peanut butter caramel. Get this when you go! You will thank me! For our last lunch before heading home, we ate at YardBird. We got an order of biscuits. They were actually pretty good!!! It came with some amazing honey butter and jam. Chicken Legs ordered off the secret menu. It was on their Instagram Story. 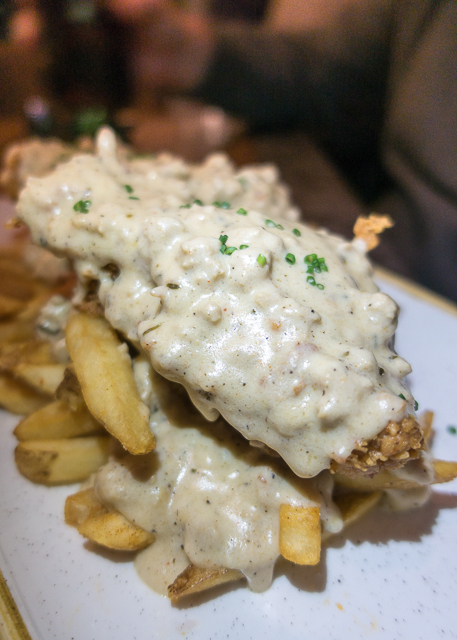 Chicken Poutine - fries topped with sausage gravy and fried chicken. 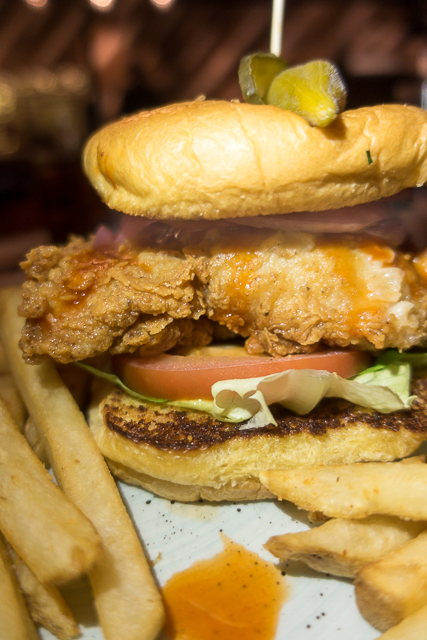 I got the Crunchy Yardbird Sandwich. 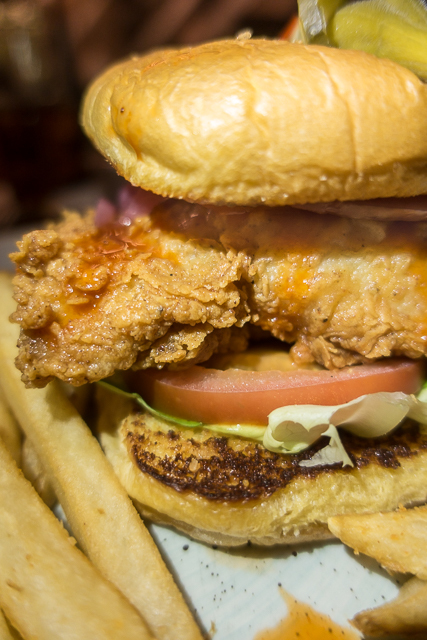 Fried chicken, hot sauce, lettuce, heirloom tomatoes and pickles. We already have our next Vegas trip booked! We are going to see Dead & Co kick off their Summer Tour. 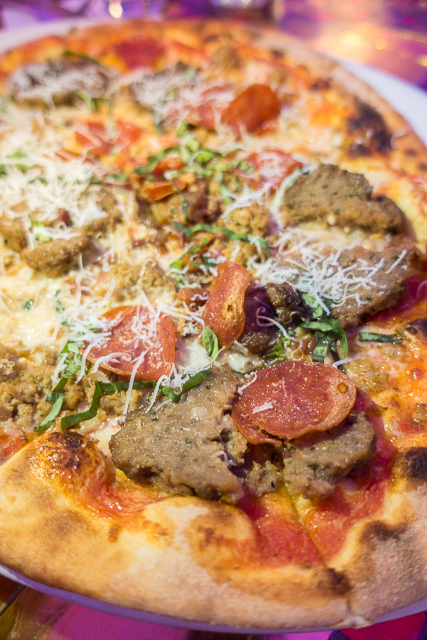 What is your favorite place to eat in Vegas? Where should we go in May? We love Vegas too and try to go at least twice a year. 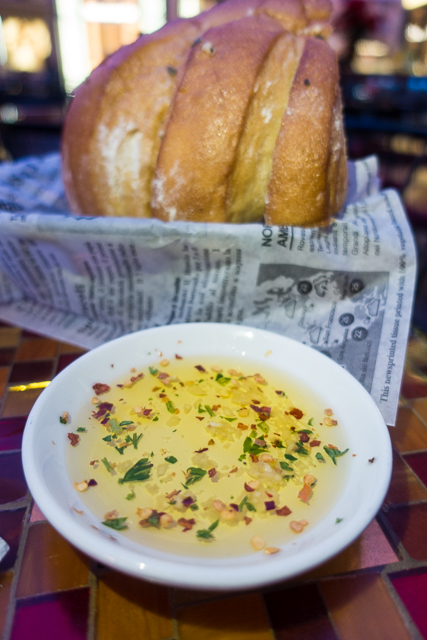 One of our favorite places to go is Vic and Anthony's at the Golden Nugget. It's awesome. 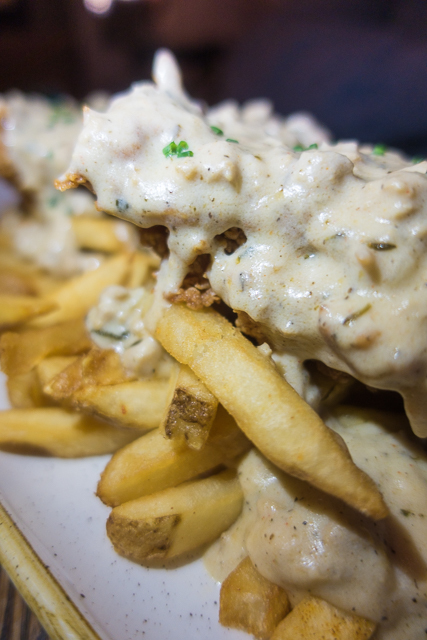 Try the quail for an appetizer, you won't be disappointed. 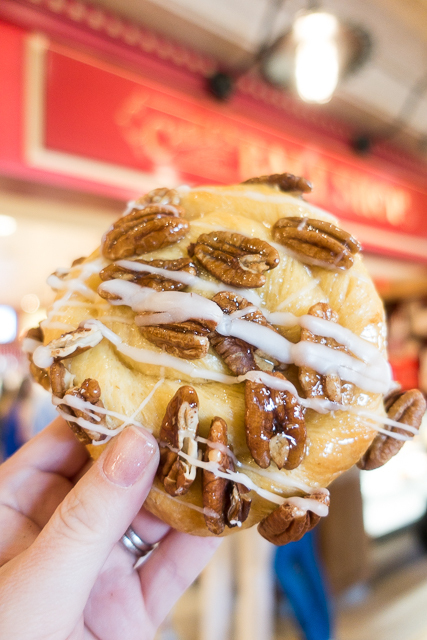 It has a sweet yet spicy taste. The steaks are large so you and chicken legs can split. We get the ribeye. The staff is wonderful and knows the menu well. Reservations are a must. Have fun! 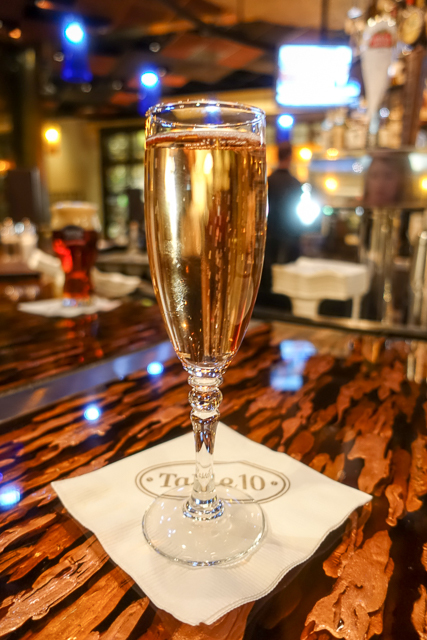 We love Hugo's Cellar in the 4 Queens downtown. Beautiful old school restaurant with amazing food! Also, we are going in October for my birthday, looking forward to trying some of these places! I love reading your Vegas posts! 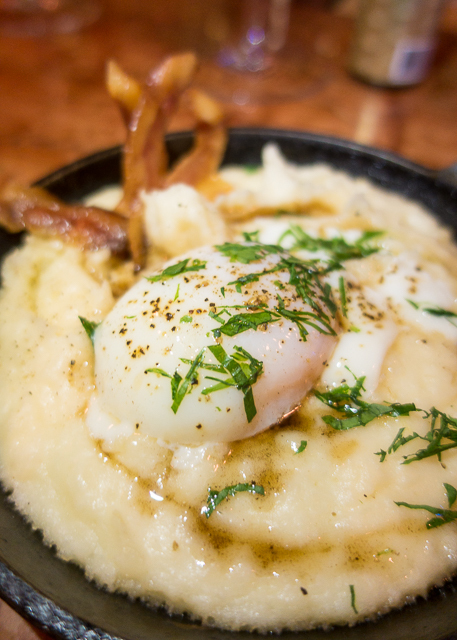 We go to Vegas once or twice a year and we've tried (and loved) a few of your favorites. My top 3 must-eats are Hubert Keller's Burger Bar in the shoppes at Mandalay Bay (best burgers I've ever had), Giada at the Cromwell (love the pizzas and daily cheese tray for lunch, shrimp, lemon & basil spaghetti, and the cookie sampler) and Cut at the Palazzo (I think it's better than Carnevino. If you can't make it for dinner, definitely get a drink at the bar and try the duck fat popcorn). this post had perfect timing. i'm planning a trip to Vegas in June for my birthday and i've been looking for places to eat and things to do. Yum! I've been to a few of these restaurants with my husband and friends and your write-up/review is wonderful! 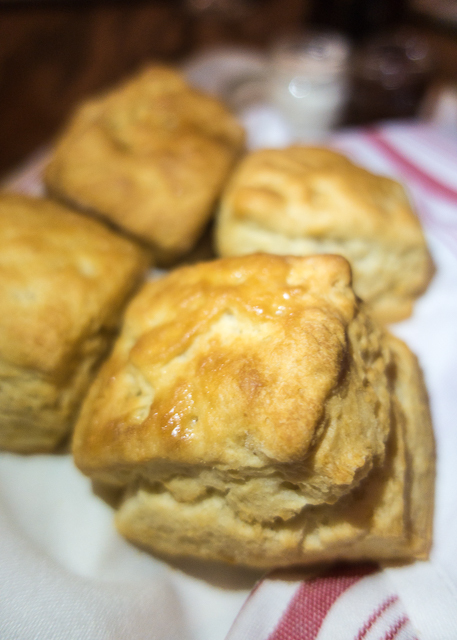 I love Yardbird - their biscuits are super delicious. Grimaldi's for pizza is awesome! We go to the one off-strip....on South Rainbow, I think....since my bestie lives near there and a fantastic hair colorist & stylist is nearby. We're headed to Vegas the first week of March and this post is super helpful. We've been to Vegas many times but are always on the lookout for new restaurants we haven't tried.